The last time we worked with this cute little family, the little fellow was a mere bun in the oven. Well we finally got to meet him today and we are so happy we had the opportunity too. The girls were cute as ever, and growing like little twigs. Thanks guys for allowing us another opportunity to work with your family. 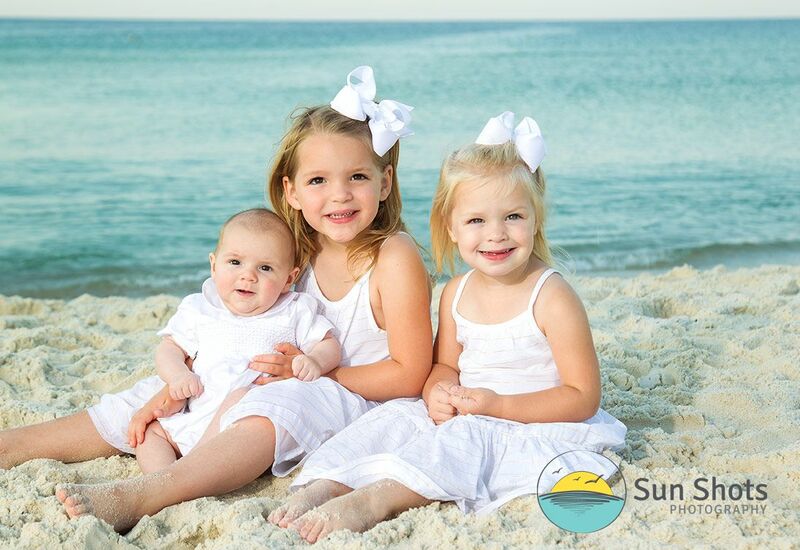 We hope you have a wonderful vacation and we really feel blessed to be your Orange Beach family photographers. It is always so nice to have repeat customers. Not only do we get to see just how much the kids have grown, we get to see what else is going on in everyones lives. When we spend time with clients on the beach, it is such a relaxed environment, it just seems natural that all let their guards down and invite each other into the others respective lives. Though we are the artist and our families are the subject, we always seem to pickup new friends. I guess that is natural when sharing such intimate moments that are destined to become family heirlooms. This is one aspect of our job we really, really enjoy. I just love answering the phone and hearing a familiar voice and name. Nothing better than repeat customers. It is as if we get the notion that our friends are coming back on vacation and we get to spend some more, much needed, one on one time together. For this we are definitely blessed. Getting to share more of our art with them is yet another layer of icing on the cake. If you family is coming to the beach this summer, we would love the opportunity to share some beach time with you and be your Orange Beach Family Photographers. We welcome you to become one of our clients, and have a little acquaintance time. We are positive the results will be outstanding. Give us a call today!